Luckily, your new state-shaped pan is already seasoned, so you’re ready to rock ‘n’ roll with your first dish right away, directly out of the packaging. Cast iron, however, is like a living member to your cookware arsenal. It periodically needs a little maintenance to help keep its non-stick, well-seasoned properties in good working condition. Time : 4 minutes, really! 1) Wipe it out Wipe the excess oil & food particles out with a paper towel. 2) Wash it up Hand rinse the inside with warm water only, and a cloth. 3) Dry it off Towel dry and put over heat for a minute or two. 4) Oil it on Drizzle a teeny-bit of oil into the pan, spread it everywhere with a paper towel leaving only a very thin film of oil. It will feel like you’re taking the oil off of the pan again. 5) Burn it in Allow the oil to reach its smoke point over heat, another minute or two- make sure you turn on your kitchen fan, open a window or get whatever ventilation you can. 6) Cool it down Turn off the heat and allow the pan to naturally cool down slowly. Here are two wildly different approaches to a successfully blackened finish revered by all cast iron cookware fans. To accomplish an even re-seasoning on your cast iron pan, you can use your household oven and and a rag in this easy 6 step process to achieving that coveted blackened appearance in a well seasoned pan. 1) Wash your with warm water and a wee bit of soap to start. 2). Dry it thoroughly over a flame or in the oven at 200 degrees to make sure it’s bone dry. This step also helps to open up the pores of the iron in preparation for accepting the oil for a great seasoning. 3) Take out the warm dry pan and drizzle a little flaxseed oil into it. Rub it everywhere around the pan, inside and out, don’t forget the handle too! After it’s been thoroughly oiled, wipe it ALL OFF with a new towel or cotton cloth until it looks dry again. The micro layer of oil is all you need to start. Honest ! The pan should not look wet or have any puddles / streaks of oil running down it anywhere. It will seem dry again, which is perfect. 4) Put your pan upside down into the oven, and turn the oven up to its highest baking temperature ( 450-500° F), allowing the cold pan to preheat with the oven. 5) Once your oven hits the pre-set temperature, start the timer for a 1 hour bake session, and TURN ON YOUR KITCHEN FAN. The seasoning process technically happens when the oil bakes above its smoke point, which polymerizes the first layer of oil on the surface of the pan. 6). After the first hour is up, let the pan cool naturally in the oven for 1 hour, then repeat the process a total of 6 times – yes, 6 TIMES ! This is the most ideal way to insure your pan will have the darkest, most even & hardest seasoning you’ve ever seen in an iron skillet! 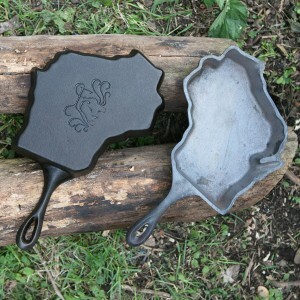 Few things compare to the adventures one can have while traditionally seasoning your cast iron cookware. The open-flame process involves building a wood fire outside and rolling up your sleeves for a couple hours; perfect for the tool-heads & thrill seekers out there. We’re not going to lie, this method does require a little more grit & ambition than the oven seasoning approach. The good news is you can enjoy the fact that this process is about 6 times quicker than oven seasoning. Carbon flames & the higher temperatures achieved by wood-fires, creates the perfect environment for the Flax seed oil to polymerize rapidly into the surface of the iron, achieving a profoundly rich and baked in series of seasoned layers in the most deep & effective way. Respirator or particulate mask if you’re sensitive to oily smoke. Using a box fan to blow away smoke helps a lot. A second grill rack, extra pieces of dry wood or a stump to set the hot pan onto while you oil the pan cyclically within this process. A spray bottle filled with the seasoning oil ( or HVLP gun if you have an air compressor and like using spray gun equipment. Buy a new gun for this material. Harbor Freight has a nice small option for under $12 ). 1. Build a fire up until you have a bed of red embers & a low, non-sooty flame. ( 30 min. ) This kind of fire is nearly smokeless & hot as all get out. 2. Set the clean iron over the fire & heat ‘till it turns “white-blue” in color. This means it’s ripping hot, and you’re now ready for the first coat of oil ! 3. Hook the handle, pull the pan off the fire, & mist it evenly with the Flax Oil. 4. Not Too Much! You don’t want puddles, drips or thick coats. Just a very thin & even layer into every nook, cranny, handle & backside. The pan should be smoking fiercely when you do this. Stand down wind. 5. Put the smokin’ pan back onto the fire & let it smoke out until it stops. Watch for uneven heating & adjust the iron over the best heat spot on your fire. 6. You’ll know you are ready for the next layer of oil when you see the ash of the fire wisp off the face of the once sticky oiled surface. The color should be even, the first few coats have a brownish-red hue on them, & the pan will look dry again. 7. Repeat steps #2-#5 about 6 times ! You’ll see the pan turn to a rich “blue-black” by the last round of oil. (Approx. 1 hour of seasoning.) Enjoy the fire when you’re all done & marvel at your crafty work while letting your iron cool down naturally on a wire rack. Be very careful to not put the hot onto something wet or cold! The dramatic difference of temperatures could cause a cast iron skillet to crack or warp from thermal shock!Your pan should be a deep black color and ready to use within one hour’s time of this open-fire process. Stick to these simple rules, and your food won’t stick to your pan . Never put your cast iron in the dishwasher. Even if you have a major clean-up job to perform from burned food in the pan. A quick wipe-around and hand washing’ is all that your pan technically needs. But if you’re uncomfortable not using soap, you can squeeze just a wee-bit of soapy water from a towel into the pan. Just make sure to dry it immediately thereafter & give it a little oil for good measure to keep it from developing rust. For really tough jobs, try this : Fill the pan with water, bring to a boil, let it cool, and scrape off the loosed / softened crud with a plastic scrape tool or soft scrub pad to get it clean. If seasoning is still there, follow the Maintenance Routine above. If it’s bare metal, you need to re-season the pan again. Never put your cast iron in the microwave. 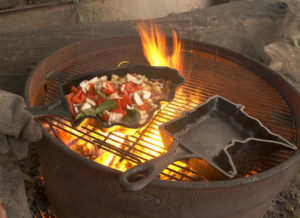 Cast iron is fit for any induction, gas, electric and ceramic cook tops. It’s especially great for the oven, grill and camp fire. Anything metal in the microwave is a lightning storm waiting to happen- not good! Avoid metal scrubby pads: This abrasive approach to cleaning should only be used if you intend to re-season your pan right away. The seasoning on your cast iron pan can scratch off with some effort, so be aware that this method of cleaning is only recommended for total refinishing, such as with old neglected cookware or if something was left to burn in drastically on the surface of your pan. Even still, try the trick above for heavily soiled pans before you get too serious with the metal scrubby. Beware Thermal Shock: A little known fact about cast iron is that it can actually warp or even crack if put under conditions of being “quenched” or cooled too rapidly. Cast iron is best kept when it can heat and cool slowly and evenly. So just be careful about putting a ripping hot pan onto something cold or wet, such as a boulder or tree stump if you’re outside, or directly into the wash-bin before it has a chance to naturally cool slowly.